Why Save Species From Extinction? Extinction is a normal part of the process of evolution – its counterpart being speciation, in which new species emerge, or more accurately, diverge. It is not the place of humans to try to control nature, but we are putting an enormous extinction pressure on the environment (hence the nickname Homo destructus). It’s about time we put our money and effort into conserving the unique species we have left, before it’s too late. Humans have caused a huge number of extinctions in recent history, and we continue to do so today. Our forager ancestors managed to wipe out the largest animals on every island they migrated to, including Australia, the Americas, Madagascar and the Galapagos. This doesn’t mean we’re off the hook, it means we are already in big trouble! Current extinction rates across the globe are severely high – comparable to the five mass extinctions that have occurred in the past 600 million years. Previously, the triggers were large asteroids colliding with the earth, volcanoes or severe climate change causing epic inhospitable winters, wiping out as much as 90% of the existing species at that time1. These extinction events may have taken tens of thousands of years, yet we’re causing noticeable, irreversible change within just a few hundred1. Never before has an extinction of millions been caused by one, single species2. Us. We are causing a sixth mass extinction. And it is our responsibility to prevent this atrocity. Won’t a mass extinction free up ecological niches and allow a novel evolutionary diversification? Yes, this has been known to happen in the past. But previously it took anywhere from 5 – 30 million years for biodiversity to recover to pre-extinction levels1. How do we cause extinctions? Hunting and exploitation: Big game, known as megafauna, have been killed all across the world for meat and for trophies. Overfishing and trawling continue to cause unimaginable declines in the world’s aquatic ecosystems. Destruction of habitat: Huge declines in forests provide cleared land for agriculture or urban areas (see figure). Invasive species: Moving species (accidentally or deliberately) to foreign locations where they decimate local populations of endemic species. Climate change: Many species can’t adapt or migrate fast enough to the rapidly changing climate. There’s 7.37 billion (and counting) of us straining planet Earth’s precious resources to their limits. We are all responsible for the decline and loss of each species, each distant (or close) cousin that we share this home with. Therefore, we are 100% responsible for saving the many, many species that we’re driving extinct. Biodiversity, the varieties of life, is the most valuable, extraordinary thing on this planet (and perhaps the universe) so it’s our duty to stop indiscriminately wiping it out. We must finally display the wisdom our species, Homo sapiens, is meant to possess, by saving and restoring the planet’s ecosystems and their exquisite inhabitants. 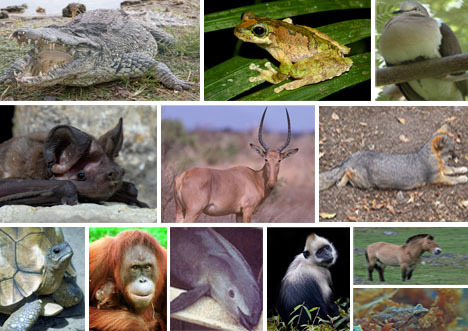 Critically Endangered Species Image from WebEcoist. 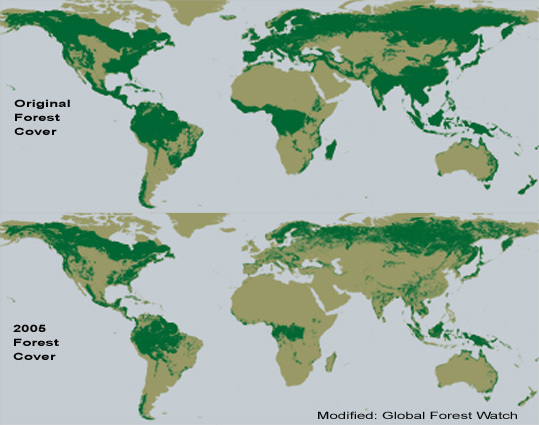 Deforestation Figure from Global Greenhouse Warming.